Abstract: Pancreatic ductal adenocarcinoma (PDAC) is among the most aggressive types of cancer and is extremely challenging to treat. The Sirtuin 6 protein (SIRT6), a multifunctional enzyme involved in gene regulation, was found to be linked to oncogenesis. 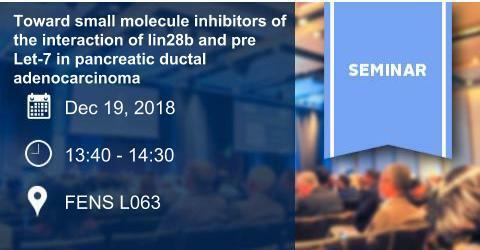 SIRT6 inactivation induces overproduction of a miRNA-binding protein, Lin28b, which subsequently impedes the maturation of the tumor suppressor miRNA, Let-7, through increased binding to its precursor. Inhibition of this pathway provides an attractive target for novel PDAC therapies. Previous research has resolved the protein:miRNA complex structure and identified small molecule in vitro inhibitors of the binding interface. Using docking-based modeling, known inhibitor binding modes are rationalized to predict novel potential inhibitors and optimize existing actives. Selected targets are purchased if commercially available or will be synthesized in our laboratory. An in vitro assay is concurrently being developed to validate the targets’ abilities to competitively inhibit Lin28b binding to pre-Let-7. It is anticipated that successful inhibitors will be evaluated in human PDAC cells.